Extend 1080p video and four USB peripheral devices to a remote location. This HDMI® extender kit lets you transmit your 1080p HD video source to your remote HDMI display at distance of up to 165 ft. away (50 m) using shielded CAT6 cabling. The extender features a built-in 4-port USB 2.0 hub that also lets you connect four remote USB peripheral devices at your display location. Using this HDMI extender, you can maintain the quality of your high-definition video signal along with the accompanying 7.1 digital audio, even at 165 feet away from your source device. The extender supports resolutions up to 1920x1200 or 1080p - perfect for dazzling your audience in remote digital-signage applications in hospitals or at shopping centers. The built-in 4-port USB 2.0 hub lets you remotely connect, access or control up to four USB devices located at your remote display - great for flash drives, printers, scanners, external hard drives and I/O devices. Remote USB extension also enables you to remotely control your source device, which is ideal for adding touchscreen interfaces at your display in market or POS kiosks. For hassle-free setup the HDMI extender offers easy plug-and-play installation with no additional software or drivers required. 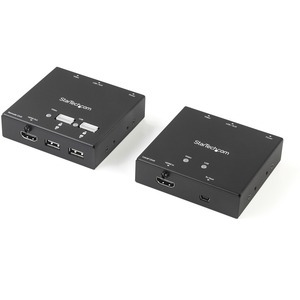 Plus, the extender passes the EDID information included in your HDMI signal, and automatically adjusts video equalization ensuring you won't have to configure it manually. Mounting hardware is also included, for a tidy and professional installation. 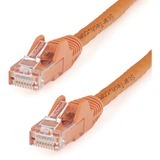 Note: To maximize performance this extender requires shielded CAT6 cable. 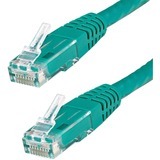 When using unshielded CAT6 cable the maximum distance is reduced to 30m. 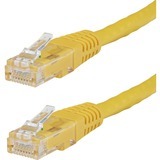 When using CAT5 cable the maximum distance is reduced to 15m. 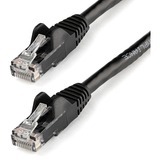 The ST121USBHD is backed by a 2-year StarTech.com warranty and free lifetime technical support.